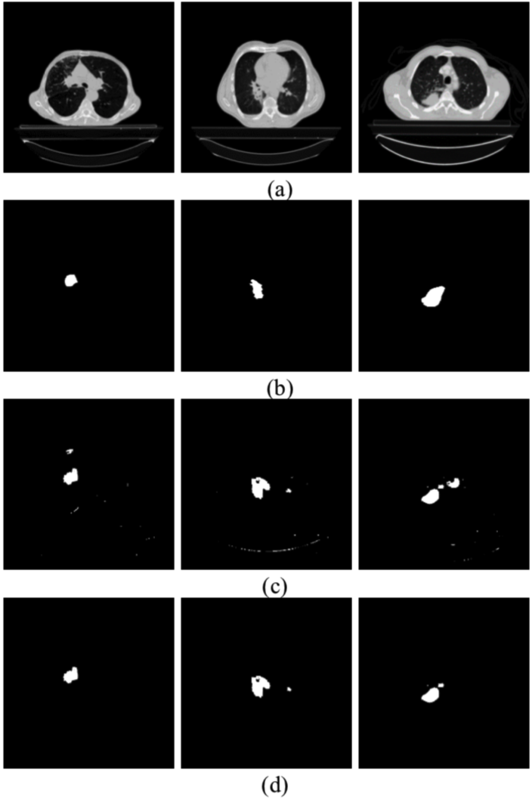 Segmentation results: (a) original images, (b) ground truth, (c) results generated by U-Net, and (d) results after radiomic analysis. Our proposed method for tumor segmentation uses a deep neural network for segmentation, followed by a radiomic analysis for removing false positives from the segmentation results to further improve the accuracy. We have adopted U-Net, a deep neural network, for the segmentation of tumor regions in the CT scans. U-Net was designed for medical image segmentation. 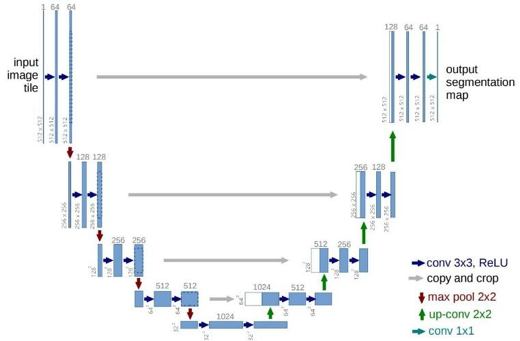 With the segmentation results generated by U-Net, some false-positive segments will appear. Therefore, a process similar to radiomic analysis, was carried out to rectify this issue. After evaluating the performance of various networks, ResNet-18 can achieve the best performance, in terms of reducing the false positives as well as keeping the true positives. 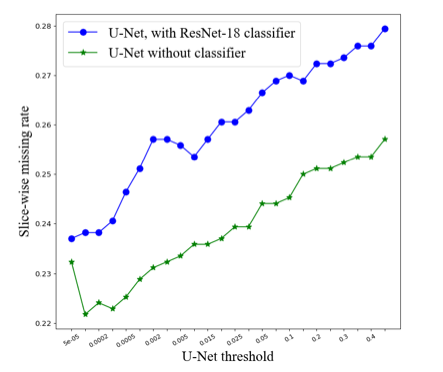 Using the extracted deep features for classification, each segmented region generated by U-Net is classified as to whether it contains a real tumor or not. Six evaluation metrics were measured – the dice coefficient, mean surface distance, 95% Hausdorff distance, slice-wise missing rate, false-alarm rate, and CT-scan-based accuracy. 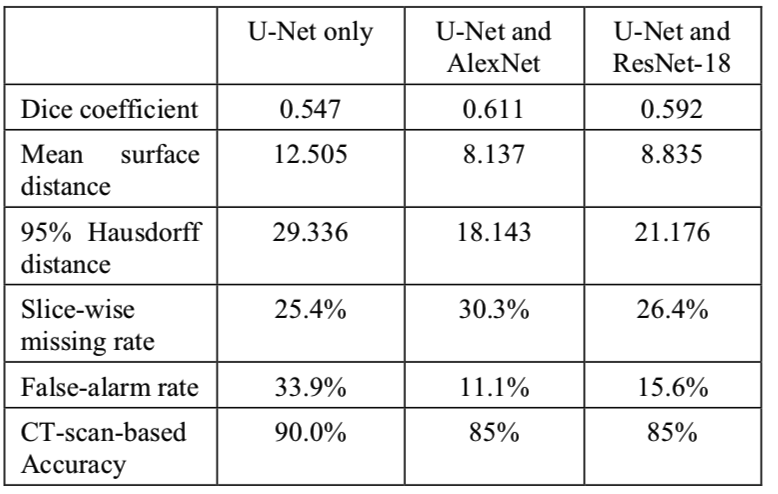 With the use of U-Net only, the six evaluation metrics are 0.5471, 12.505, 29.336, 25.4%, 33.9%, and 90%, respectively. After using the ResNet-18 for radiomic analysis, the six metrics become 0.592, 8.835, 21.176, 26.4%, 15.6%, 85.0%, respectively. The models are implemented by PyTorch and the data sets used in our experiments come from the 2018 IEEE SPS Video and Image Processing (VIP) Cup competition. Runze Zhang, Zhong Guan, Shun-Cheung Lai, Jun Xiao, and Kin-Man Lam (2018).